In July the Warwickshire moth group visited Brandon Wood again to survey the moth species found in the wood. Eighty five species were identified an increase on the seventy species identified last year. Of the eighty five, six had not been recorded in Brandon Wood before. Whilst packing up the following morning a Purple Emperor butterfly landed in the boot of one of the cars. 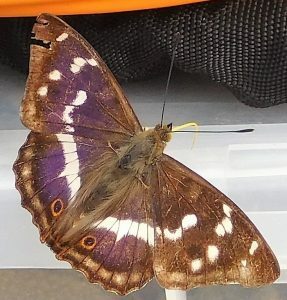 The Purple Emperor had also not been recorded on Brandon Wood previously.